By combining a readily available jQuery calendar, known as WDCalendar, with my own extensive customizations and additions to the jQuery source code to make it work the way I wanted it to, and with a few custom XBasic functions to pull it all together, I developed a custom scheduling calendar for my Alpha Five web projects. 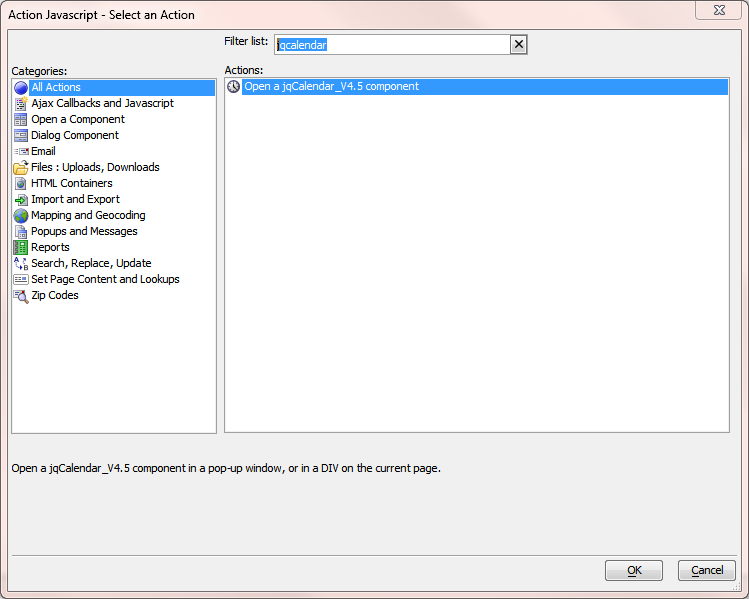 A5 JQCalendar: How "User Defined Components” in Alpha Five v11 enable developers to build and distribute custom web application components with the "look and feel" of native Alpha Five components. The A5 JQCalendar project began as a custom component (another of the new version 11 features) for use in one of my own web applications. I am an independent developer who writes applications for my own use in a couple of businesses that my wife and I own. I started with Alpha Four back in the DOS days and have used Alpha Five since v6. When v10 was introduced, I decided to move one of my larger applications over to the web. v11's release has convinced me that I made the right choice. When I realized that other developers may want to purchase my custom component to use in their own projects, I added more features and options and then converted them to a User Defined Component (UDC). 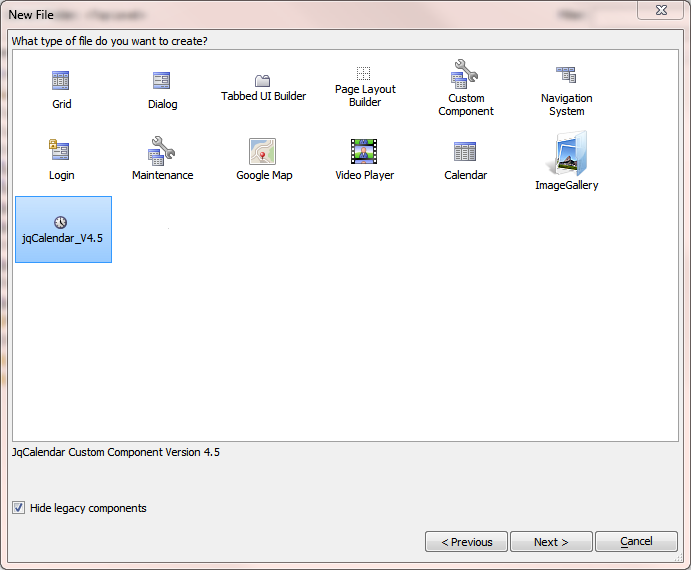 There are articles in the built-in Documentation Viewer that's included with Alpha Five v11 that give a good overview of how to create a custom component and how to turn them into a UDC. By using AlphaDAO, portable SQL and Alpha Five's rich set of XBasic functions, I was able to build in support for MySQL, Microsoft Access, Microsoft SQL Server and PostgreSQL back-end SQL databases as well as DBF tables. 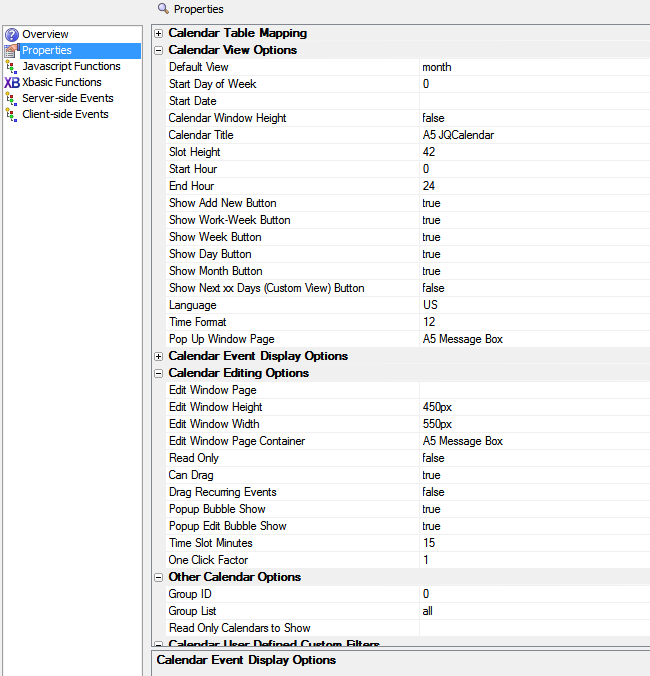 By using a fair amount of XBasic, and the UDC property sheet, I was able to build in table-mapping to allow users to use their own calendar table column names. I used jQuery AJAX callbacks to handle the drag and drop edits. For more detailed edits, I used an A5 V11 dialog2 component on an a5w page that is loaded via an AJAX callback. The data binding available in the dialog2 component made it easy to give users a familiar interface for adding, editing and deleting events without having to write the code to persist the changes back to the database. Alpha even made it simple to specify a style in the UDC property sheet. The style is then “inherited” by the A5 Message boxes I integrated into the calendar’s code, as well as the dialog2 component. This makes for a very clean user interface that blends in nicely with other native A5 components. Due to the way that Alpha Five has built the User Defined Component to integrate seamlessly into the Alpha Five web project control panel, the UDC is available as a choice from the control panel when creating a new web component. Once a UDC component is saved, it is available as a choice to add to a Tabbed UI, to embed in a dialog or add to an .a5w page etc... Alpha Five has built in support for the UDC, so Action Scripts that work with native Alpha Five components are also available for use with the UDC. For more information about A5 JQCalendar visit http://www.a5customsolutions.com/A5-JQCalendar-Connector.html.